Atrial fibrillation remains the most common arrhythmia worldwide, with pulmonary vein isolation (PVI) being an essential component in the treatment of this arrhythmia. In view of the close proximity of the oesophagus with the posterior wall of the left atrium, oesophageal injury prevention has become a major concern during PVI procedures. Oesophageal changes varying from erythema to fistulas have been reported, with atrio-oesophageal fistulas being the most feared as they are associated with major morbidity and mortality. This review article provides a detailed description of the risk factors associated with oesophageal injury during ablation, along with an overview of the currently available techniques to prevent oesophageal injury. We expect that this state of the art review will deliver the tools to help electrophysiologists prevent potential oesophageal injuries, as well as increase the focus on research areas in which evidence is lacking. Luigi Di Biase is a consultant for Biosense Webster, Stereotaxis, Boston Scientific and Abbott. He has received speaker honoraria/travel costs from Medtronic, AtriCure, EPiEP, Pfizer and Biotronik. Arrhythmia & Electrophysiology Review 2018;7(1):24–31. Oesophageal injury prevention has become a major concern in the field of electrophysiology since the first case of atrio–oesophageal fistula was reported as a complication of endocardial surgical radiofrequency ablation (RFA),1 with Scanavacca et al. and Pappone et al. subsequently reporting this complication in patients who underwent percutaneous pulmonary vein isolation (PVI) for AF.2,3 It is well recognised that oesophageal wall injury, varying from erythema to ulceration, is common and has been described by endoscopy in up to 47 % of patients following PVI.4,5 The potential of atrio–oesophageal fistulas is a limiting factor for optimal ablation in a considerable number of PVI cases, as close contact between the oesophagus and the posterior left atrial wall limits the amount of energy delivered in this area. In the vast majority of patients undergoing AF ablation, a large contact area between the left atrium (LA) and oesophagus can be observed. The mean vertical contact length is 4.4 cm and the mean distance between the anterior wall of the oesophagus and the posterior LA endocardium is only approximately 2.6 mm (range: 1.4–6.0 mm).6 In addition, the thickness of the pulmonary veins (PV) wall and PV antrum has been reported to be as little as 2–3 mm, generally thinner than the atrial myocardium at the posterior or anterior free walls (Figure 1).7 From an engineering study using a theoretical model, oesophageal injury results exclusively from thermal conduction from the atrium and is mainly influenced by the thickness of the intervening connective tissue.8 Additionally, damage of the vagal plexus coursing along the oesophagus can result in gastric hypomotility and gastroparesis.9 As such, techniques to prevent oesophageal damage during AF ablation have generated considerable interest during the last decade. Although no major prospective studies are available delineating risk factors for the development of oesophageal damage, Martinek et al. retrospectively reported in patients diagnosed with persistent AF, who underwent additional ablation lines, had LA enlargement, were exposed to high oesophageal temperatures, received increased power during energy delivery on the posterior wall, had a short atrium-to-oesophagus distance (defined as a distance of <2 mm), were exposed to the use of nasogastric tubes, and underwent general anaesthesia to be at increased risk of oesophageal injury and stroke risk.16,17 Interestingly, Good et al. reported that the oesophagus naturally shifts sideways by ≥2 cm in most patients undergoing PVI via conscious sedation.18 These observations led to the development of intraoperative monitoring tools to prevent and/or decrease potential oesophageal damage during ablation. The blood supply, nerves and surface of the oesophagus can be affected when RFA is applied on the posterior wall of the LA. When performing RFA, important factors to consider are thermal conduction, increases in intraluminal temperature, magnitude and duration of local tissue heating, energy delivery, catheter tip size, contact pressure and atrial thickness.7,8,26 Different methods are available to help mitigate oesophageal injury, including intra-procedural oesophageal temperature monitoring, titration of delivered energy, mechanical displacement of the oesophagus to avoid direct damage (with the objective of increasing ablation time on the posterior wall), and using post-procedural proton pump inhibitors (PPI) and sucralfate to prevent inflammatory changes associated with these RF lesions. These will be reviewed in the following sections. However, oesophageal temperature monitoring is not without controversy. Deneke et al. initially suggested that routine monitoring may contribute to oesophageal damage caused by thermal effect.28 In a prospective study conducted by Muller et al., 80 patients with drug refractory or longstanding persistent AF underwent posterior wall ablation with a limited power output of less than 25 W and received either continuous oesophageal temperature monitoring or no oesophageal probe. The incidence of oesophageal injury assessed by endoscopy was higher in patients with temperature monitoring compared to those without (30 % versus 3.5 %, p<0.01) and multivariate regression analysis showed that the use of an oesophageal temperature probe is the only independent predictor for the development of oesophageal damage (OR 16.7, p<0.01).29 However, there is controversy about the existence of this so-called “antenna effect”: while Nguyen et al. reported that ablation in close proximity to metal resulted in higher temperatures in surrounding tissues leading to significant tissue heating,30 this was not confirmed in a computational modelling study by Pérez et al. in which no electrical and/or thermal interaction was found between the ablation catheter and the oesophageal temperature probe.31 According to the 2017 AF ablation consensus statement, there is general agreement that it is reasonable to use an oesophageal temperature probe during RF ablation procedures to monitor oesophageal temperature and help guide energy delivery (Class IIA, LOE-C).32 Currently, it is common practice to stop ablation when a rise of 1–2°C in intraluminal temperature from baseline occurs, or a temperature of 39–40°C is reached during ablation. Nonetheless, the role of temperature monitoring as a sole predictor for oesophageal injury is debatable. Despite the well-established relationship between energy delivery and oesophageal temperature elevation, other factors associated with oesophageal lesion formation are at play.21,27 Tissue contact force has been described as having a key role for injury development.33 Because factors such as LA thickness and distance between the oesophagus and the LA vary among patients, they have been implicated as determinants of the amount of heat that is being transferred to the oesophagus.7,34 One of the most prevailing arguments against the use of an oesophageal temperature probe is that it can create a false sense of security. Owing to the size of the oesophagus, the ablation electrode might not align with the temperature probe, leading to a spuriously low temperature reading, which in turn could lead to increased power delivery or ablation duration on the posterior wall.35 Different probes are currently available with significant variations in temperature reading, , including multi-sensor, single-sensor and stethoscope models. Thus, the level of intraluminal temperature cut-off that can be considered safe has major variations according to the probe used (Figure 3).36 However, Tschabrunn et al. reported that multi-sensor self-expandable probes appear to provide greater sensitivity (100 % versus 60 %) and similar specificity (60 %) for the detection of oesophageal ulceration than single electrode probes.37 More evidence is needed to fully evaluate the role of oesophageal temperature monitoring in AF ablation, as well as to compare the different types of monitors and energy delivery. With non-irrigated ablation, lesion width and depth increases linearly as a function of electrode-tissue interface temperature up to 90°C. Nevertheless, coagulum formation on the catheter tip occurs with temperatures exceeding 80°C and sudden impedance rises can occur, frequently limiting the duration of RF delivery and thus the extent of energy delivery to tissue. Producing deep lesions with irrigated ablation may not be optimal in thin-walled tissues such as the posterior LA, which lies in close proximity with structures vulnerable to collateral injury, such as the oesophagus and the lungs. On the posterior LA, the deep lesions produced by irrigated ablation catheters may expose the oesophagus to much higher temperatures without increasing the success of ablation, since a sufficient endocardial lesion could be achieved with non-irrigated catheters (Figure 4). In an experimental clinical study by Kumar et al.,43 the authors hypothesised that short duration, low-flow irrigated radiofrequency ablation of the posterior LA would allow creation of transmural lesions with a maximum diameter at the endocardial surface, without compromising safety or efficacy. Biophysical parameters and pathology measurements were compared between open irrigation at low flow (2 mL/min) versus conventional flow rates (17 mL/min) during irrigated catheter ablation in 20 swines, along with biophysical parameters in 60 patients undergoing de-novo catheter ablation for AF. Low flow ablation compared to control in swine had larger impedance decreases (median 20 Ω versus 8 Ω, p<0.001), higher incidence of loss of pace capture (44 % versus 18 %, p<0.001), more electrogram-based transmural lesions (57 % versus 9 %; p<0.001), and more visible lesions on anatomic inspection (75 % versus 41 %, p=0.007). Low flow, compared to standard higher flow irrigation, also produced a more rapid impedance drop with shorter RF applications, while achieving a higher incidence of electrical inexcitability with pacing. This was noted in both swine and human studies. Importantly, no evidence of an abrupt rise in impedance, steam pops, or coagulum formation was noted with low-flow ablation at 20–25 W and limited duration (i.e. 10–15 seconds). 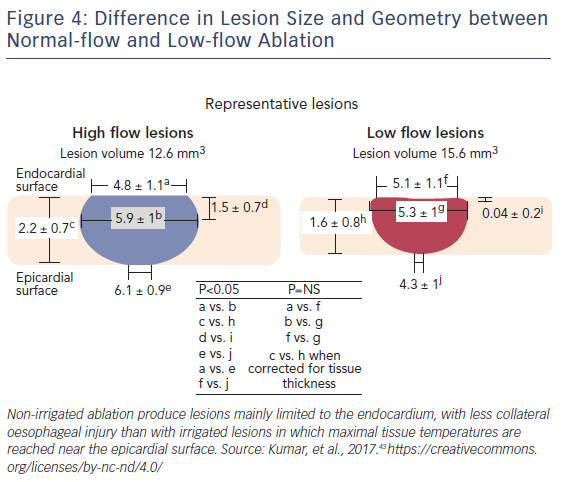 The greater tissue and catheter tip temperatures seen with low-flow lesions seem to be responsible for the larger impedance decreases, which may partially explain why impedance alone is not a good predictor of overall lesion size, rather a better predictor of surface heating. In the human ablation analysis, the extent of impedance decrease, the loss of pace capture, and achievement of transmurality post-ablation strongly favoured low-flow lesions, therefore supporting this approach to posterior LA ablation to prevent oesophageal damage. Another potential intervention for oesophageal protection during LA ablation is actual mechanical oesophageal displacement. Proper identification of structures that lie in close proximity to the oesophagus is a critical step before mechanical displacement is considered. The oesophagus has been reported to be a highly mobile organ, without a serosal layer, and although fixed in the mediastinum (primarily in the pharynx and gastro-oesophageal junction), its position can be variable. Good et al., using barium paste and digital fluoroscopic imaging, reported that under conscious sedation the oesophagus shifts sideways at least 2 cm.18 Oesophageal movement varies along the LA surface, with a mean displacement of 2.0 ± 0.8 cm (range: 0.3–3.8 cm) in the superior portion of the oesophagus, 1.7 ± 0.8 cm (range: 0.1–3.5 m) at the mid-oesophagus, and 2.1 ± 1.2 cm (range: 0.1–4.5 cm) inferiorly. Accordingly, two small studies were published with the aim of addressing possible techniques for mechanical oesophageal displacement. Chugh et al. aimed to determine the feasibility of mechanical displacement through the help of an endoscope with a flexible tip in 12 patients during AF catheter ablation.44 In 9 of the 12 patients, this was a redo procedure performed because of an incomplete PVI and recurrent arrhythmia detection due to an unfavourable LA–oesophageal relationship during a prior ablation procedure. In 10 (83 %) of the patients, the oesophagus was displaced toward the left and right to a maximum of 2.4 and 2.1 cm, respectively. In two (22 %) of the nine patients in whom a prior procedure was unsuccessful due to rise in intraluminal oesophageal temperature, the displacement facilitated effective energy delivery at target site. The downside of this technique is that there is a theoretical concern that RF energy might be shifted from the ablation catheter to the endoscope. Therefore, RF ablation is only performed if the oesophagus remains in the same place after the probe has been removed. Using a different approach, Koruth et al. placed an endotracheal stylet within a chest tube to mechanically deviate the oesophagus in a cohort of 20 consecutive patients undergoing RFA or laser balloon for AF (there was no control group).45 Leftward oesophageal deviation of 2.8 ± 1.6 cm and rightward deviation of 2.8 ± 1.8 cm was observed. Temperature rose to more than 38.5°C in three (15 %) of the patients. There was no rise of temperature greater than 40°C. Post ablation, all of the patients had an upper gastrointestinal endoscopy to evaluate for ulcer formation. Of the 19 patients analysed, 18 (95 %) showed no ulceration from thermal injury. Overall, 12 patients (63 %) showed lesions that were classified as mild (9) and moderate (3) intensity oesophageal instrumentation-related trauma. During follow-up (mean 40.6 days), no patient developed dysphagia or gastrointestinal bleeding. Transoesophageal echocardiogram (TOE) has also been used to mechanically displace the oesophagus during AF ablation procedures. Herwerg et al. used a TOE transducer to move the oesophagus away from the ablation sites in a total of three of six patients who underwent AF ablation via fluoroscopy.46 The increased distance created by the deflection allowed for a targeted RF energy at critical sites of the posterior LA wall. No patient showed evidence of oesophageal injury, and only one of the patients presented with mild pharyngeal oedema (Figure 5). In a recent study, Parikh et al. evaluated the safety and efficacy of a novel mechanical oesophageal deviation tool, the EsoSure (NEScientific).47 In a multicenter trial, EsoSure was used to displace the oesophagus in 85 patients who underwent PVI and in whom the increase in oesophageal temperature limited the desired energy delivery at the posterior wall. All PVs were successfully isolated without a rise in oesophageal temperature (Figure 6). At 3-month follow-up, 7 % of patients reported self-limited dysphagia; no other major complications were seen. A randomised clinical trial testing a new investigational oesophageal deviation device by Reddy et al. (NCT01546168) was stopped due to lack of statistical significance after an interim analysis was performed. No difference was found between the use of this device for mechanical displacement and oesophageal temperature monitoring alone; results have yet to be published. Mechanical displacement of the oesophagus appears promising and safe, and should allow for complete LA PVI, especially in patients with a thinner posterior atrial wall. Nevertheless, when performing displacement of the oesophagus, its complete anatomy should be delineated, as elegantly reported by Palanisway et al. Some probes have the disadvantage of not properly identifying the trailing edge of the oesophagus, which could lead to inadvertent injury.48 In addition, given the mobile nature of the oesophagus, trauma has been reported when a stiff stylet is used for mechanical displacement.45 Large prospective randomised clinical trials are still lacking, and therefore a more robust measure of efficacy and safety is yet to be determined. 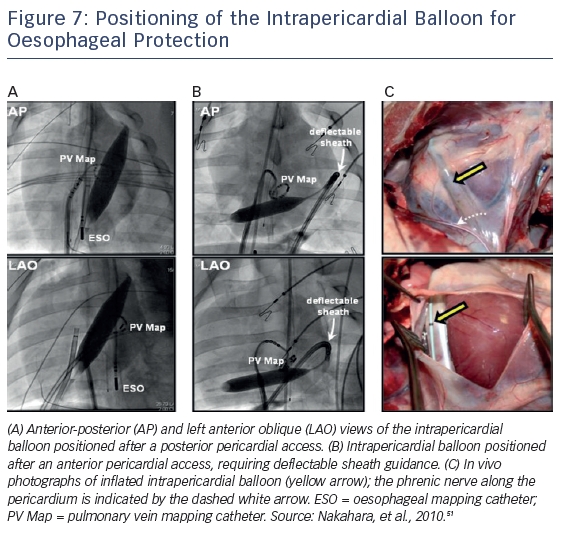 Protection of the oesophagus can also be accomplished by inflating a balloon catheter (18 mm × 4 cm balloon dilation catheter; Meditech [Boston Scientific]) in the pericardial space. Buch et al. initially described this procedure during epicardial ventricular tachycardia ablation in a patient with repetitive drug refractory monomorphic ventricular tachycardia to mechanically distance the phrenic nerve.49 More recently, the same group described using this technique to protect the oesophagus and right phrenic nerve during AF ablation in a porcine model and in humans, thus allowing safe complete isolation of all four PVs.50,51 The distance between the oesophagus and posterior LA balloon inflation increased by 12.3 ± 4.0 mm, considerably attenuating the luminal oesophageal temperature increase during endocardial RFA (i.e. 6.1 °C versus 1.2 °C; p<0001).51 Similarly, after displacement of the right phrenic nerve with the intrapericardial balloon, nerve capture was abolished in 91 % of sites previously stimulated by pacing (Figure 7).51 This technique, while effective, does require epicardial access with its inherent risks. As an alternative strategy to RFA, the use of cryoablation for targeting AF triggers has been proposed in multiple studies. Ripley et al. applied cryotherapy in bovine oesophagus in vivo.56 Compared to the disruption of normal cellular architecture seen in RFA, macroscopic and histologic findings after cryotherapy showed no cellular change, chronic ulceration, or fistula formation. This is corroborated by an experimental study demonstrating that cryothermal ablation preserved the extracellular matrix and endothelial integrity.57 Clinically, in a prospective study by the OPIPAF group (Ostial Pulmonary vein Isolation in Paroxysmal Atrial Fibrillation), 70 patients underwent cryotherapy as the preferred treatment for PVI.58 No PV stenosis or oesophageal injury was detected during follow-up of 33 ± 15 months post ablation. Regarding efficacy, however, 49 % of the patients achieved complete initial success, with 11 % (8) of patients showing sporadic episodes of AF post ablation. Initially it was thought that cryotherapy would not be associated with PV stenosis, oesophageal perforation, or thromboembolic events. However, in a well-reported systematic review by Andrade et al., the procedure was found not to be free of serious complications, the most common of which was phrenic nerve paralysis, with an overall incidence of 6.38 % (86 of 1349 procedures) despite the high acute procedural success rate (91.67 % complete PVI in 19 studies and 94.85 % complete PVI of targeted veins in 18 studies).59 Also seen were pericardial effusions, which occurred in 1.46 % of cases, and thromboembolic complications in 0.57 % of cases. However, no cases of left atrio-oesophageal fistulas were reported. Nonetheless, Ahmed et al., reported oesophageal ulcerations in 17 % of the 35 % of patients in whom endoscopic evaluation was performed after CB ablation.60 More recent evidence has been published verifying that CB ablation is not free of oesophageal damage. John et al. reported that the incidence of atrio-oesophageal fistulas with CB ablation is similar to that of RF ablation (<1 in 10,000).12,61 Of note, they noted that there was a particular relationship between the left inferior pulmonary vein ablation and fistula formation. Prolonged CB inflation times were noted in the fistula occurrences. The authors proposed that real-time monitoring for temperature decline in the oesophagus should quickly prompt limiting energy delivery through this method. In a recently published article by Kapur et al, a stepwise algorithm to an early detection of a potential atrio-oesophageal injury is described. A non-emergent evaluation that includes performing an upper endoscopy during the 72 hours following the procedure should be considered in patients with extreme temperature registered at the oesophageal probe during the procedure, have symptoms immediately after ablation and have a pre-existing oesophageal pathology.64 On the contrary, an emergent evaluation should be performed in all patients who present during the 6 weeks following the ablation with symptoms such as chest pain, fever or gastrointestinal or neurological symptoms along with the abovementioned characteristics for a non-emergent procedure. This emergent evaluation should include blood laboratory, transthoracic cardiac echocardiogram and chest CT with IV contrast.64 Despite the low incidence of fistula formation, early diagnosis and rapid surgical treatment are cornerstone in the management of this complication. Though rare, serious oesophageal injury during PVI and posterior wall ablation is still a major concern among electrophysiologists, particularly if left untreated, with a mortality rate of up to 100 % associated with atrio-oesophageal fistulas. In our practice and experience, we rely on a stepwise approach to prevent these potential complications. Several techniques have been described to prevent such injuries. We suggest obtaining pre- and intra-procedural oesophageal imaging to provide valuable information for ablation, given the high variability of oesophageal anatomy among patients. Despite its controversy, our group encourages the routine use of oesophageal intraluminal temperature monitoring probes during AF ablation. Mechanical displacement of the oesophagus appears feasible, safe and efficacious; nevertheless, randomised data are missing to evaluate the different tools available. Consistently in our procedures, when performing ablation lesions to the posterior wall, we prefer to use low irrigation parameters as this technique has been shown to be effective and seems to be a promising way to avoid oesophageal damage. We do not routinely use cryothermal energy ablation; however, it has been shown to have a lower incidence of oesophageal injury,64 though the data is not without debate and efficacy may be less than RFA. Given the low incidence of clinically significant events, such as atrio-oesophageal fistula, the development of strategies for the prevention of these potential complications is limited. 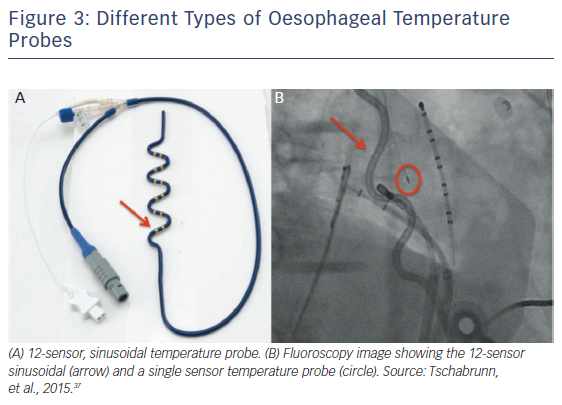 As discussed in this review, the use of different surrogates, such as variation in oesophageal luminal temperature, remains controversial and more studies are needed to evaluate oesophageal injury prevention systems. Oesophageal injury prevention has become a major concern in the field of electrophysiology. Oesophageal wall injury varies from erythema to ulceration, is common and has been described by endoscopy in up to 47 % of patients following pulmonary vein isolation (PVI). Assessment of the anatomic relationship between the LA and the oesophagus prior to the procedure is of major importance. Different techniques, including mechanical displacement of the oesophagus, intraluminal temperature monitoring, and adjusting to low irrigation parameters are options to be considered when performing lesions to the posterior wall in an attempt to avoid any potential injury. Emergent diagnostic procedures should be performed in patients with high suspicion of atrio-oesophageal fistula. Gillinov AM, Pettersson G, Rice TW. Esophageal injury during radiofrequency ablation for atrial fibrillation. J Thorac Cardiovasc Surg 2001;122:1239–40. Scanavacca MI, D’ÁVila A, Parga J, Sosa E. Left atrial-esophageal fistula following radiofrequency catheter ablation of atrial fibrillation. J Cardiovasc Electrophysiol 2004;15:960–962. Pappone C, Oral H, Santinelli V, et al. Atrio-esophageal fistula as a complication of percutaneous transcatheter ablation of atrial fibrillation. Circulation 2004;109:2724–6. Schmidt M, Nolker G, Marschang H, et al. Incidence of oesophageal wall injury post-pulmonary vein antrum isolation for treatment of patients with atrial fibrillation. Europace 2008;10:205–9. Di Biase L, Saenz LC, Burkhardt DJ, et al. Esophageal capsule endoscopy after radiofrequency catheter ablation for atrial fibrillation: documented higher risk of luminal esophageal damage with general anesthesia as compared with conscious sedation. Circ Arrhyth Electrophysiol 2009;2:108–12. Helms A, West JJ, Patel A, et al. Real-time rotational ICE imaging of the relationship of the ablation catheter tip and the esophagus during atrial fibrillation ablation. J Cardiovasc Electrophysiol 2009;20:130–7. Ho SY, Sanchez-Quintana D, Cabrera JA, et al. Anatomy of the left atrium: implications for radiofrequency ablation of atrial fibrillation. J Cardiovasc Electrophysiol 1999;10:1525–33. Berjano EJ, Hornero F. What affects esophageal injury during radiofrequency ablation of the left atrium? An engineering study based on finite-element analysis. Physiol Meas 2005;26:837–48. Shah D, Dumonceau JM, Burri H, et al. Acute pyloric spasm and gastric hypomotility: an extracardiac adverse effect of percutaneous radiofrequency ablation for atrial fibrillation. J Am Coll Cardiol 2005;46:327–30. Doll N, Borger MA, Fabricius A, et al. Esophageal perforation during left atrial radiofrequency ablation: Is the risk too high? J Thorac Cardiovasc Surg 2003; 125:836–42. Cummings JE, Schweikert RA, Saliba WI, et al. Brief communication: atrial-esophageal fistulas after radiofrequency ablation. Ann Intern Med 2006;144:572–4. Ghia KK, Chugh A, Good E, et al. A nationwide survey on the prevalence of atrioesophageal fistula after left atrial radiofrequency catheter ablation. J Interv Card Electrophysiol 2009;24:33–6. Cappato R, Calkins H, Chen SA, et al. Prevalence and causes of fatal outcome in catheter ablation of atrial fibrillation. J Am Coll Cardiol 2009;53:1798–803. Zellerhoff S, Ullerich H, Lenze F, et al. Damage to the esophagus after atrial fibrillation ablation: Just the tip of the iceberg? High prevalence of mediastinal changes diagnosed by endosonography. Circ Arrhythm Electrophysiol 2010;3:155–9. Barbhaiya CR, Kumar S, John RM, et al. Global survey of esophageal and gastric injury in atrial fibrillation ablation: incidence, time to presentation, and outcomes. J Am Coll Cardiol 2015;65:1377–8. Martinek M, Bencsik G, Aichinger J, et al. Esophageal damage during radiofrequency ablation of atrial fibrillation: impact of energy settings, lesion sets, and esophageal visualization. J Cardiovasc Electrophysiol 2009;20:726–33. Martinek M, Meyer C, Hassanein S, et al. Identification of a high-risk population for esophageal injury during radiofrequency catheter ablation of atrial fibrillation: procedural and anatomical considerations. Heart Rhythm 2010;7:1224–30. Good E, Oral H, Lemola K, et al. Movement of the esophagus during left atrial catheter ablation for atrial fibrillation. J Am Coll Cardiol 2005;46:2107–10. Redfearn DP, Trim GM, Skanes AC, et al. Esophageal temperature monitoring during radiofrequency ablation of atrial fibrillation. J Cardiovasc Electrophysiol 2005;16:589–93. Perzanowski C, Teplitsky L, Hranitzky PM, Bahnson TD. Real-time monitoring of luminal esophageal temperature during left atrial radiofrequency catheter ablation for atrial fibrillation: observations about esophageal heating during ablation at the pulmonary vein ostia and posterior left atrium. J Cardiovasc Electrophysiol 2006;17:166–70. Cummings JE, Schweikert RA, Saliba WI, et al. Assessment of temperature, proximity, and course of the esophagus during radiofrequency ablation within the left atrium. Circulation 2005;112:459–64. West JJ, Norton PT, Kramer CM, et al. Characterization of the mitral isthmus for atrial fibrillation ablation using intracardiac ultrasound from within the coronary sinus. Heart Rhythm 2008;5:19–27. Kenigsberg DN, Lee BP, Grizzard JD, et al. Accuracy of intracardiac echocardiography for assessing the esophageal course along the posterior left atrium: a comparison to magnetic resonance imaging. J Cardiovasc Electrophysiol 2007;18:169–73. Mackensen GB, Hegland D, Rivera D, et al. Real-time 3-dimensional transesophageal echocardiography during left atrial radiofrequency catheter ablation for atrial fibrillation. Circ Cardiovasc Imaging 2008;1:85–6. Sherzer AI, Feigenblum DY, Kulkarni S,Continuous nonfluoroscopic localization of the esophagus during radiofrequency catheter ablation of atrial fibrillation. J Cardiovasc Electrophysiol 2007;18:157–60. Hornero F, Berjano EJ. Esophageal temperature during radiofrequency-catheter ablation of left atrium: a three-dimensional computer modeling study. J Cardiovasc Electrophysiol 2006;17:405–10. Kuwahara T, Takahashi A, Kobori A, et al. Safe and effective ablation of atrial fibrillation: importance of esophageal temperature monitoring to avoid periesophageal nerve injury as a complication of pulmonary vein isolation. J Cardiovasc Electrophysiol 2009;20:1–6. Deneke T, Bunz K, Bastian A, et al. Utility of esophageal temperature monitoring during pulmonary vein isolation for atrial fibrillation using duty-cycled phased radiofrequency ablation. J Cardiovasc Electrophysiol 2011;22:255–61. Muller P, Dietrich JW, Halbfass P, et al. Higher incidence of esophageal lesions after ablation of atrial fibrillation related to the use of esophageal temperature probes. Heart Rhythm 2015;12:1464–9. Nguyen DT, Barham W, Zheng L, et al. Effect of radiofrequency energy delivery in proximity to metallic medical device components. Heart Rhythm 2015;12:2162–9. Perez JJ, D’Avila A, Aryana A, Berjano E. Electrical and thermal effects of esophageal temperature probes on radiofrequency catheter ablation of atrial fibrillation: results from a computational modeling study. J Cardiovasc Electrophysiol 2015;26:556–64. Calkins H, Hindricks G, Cappato R, et al. 2017 HRS/EHRA/ECAS/APHRS/SOLAECE Expert Consensus Statement on Catheter and Surgical Ablation of Atrial Fibrillation. Heart Rhythm 2017. Europace 2018;20:157–208. Nakagawa H, Jackman WM. The role of contact force in atrial fibrillation ablation. J Atr Fibrillation 2014;7:1027. Sanchez-Quintana D, Cabrera JA, Climent V, et al. Anatomic relations between the esophagus and left atrium and relevance for ablation of atrial fibrillation. Circulation 2005;112:1400–5. Black-Maier E, Pokorney SD, Barnett AS, et al. Risk of atrioesophageal fistula formation with contact force-sensing catheters. Heart Rhythm 2017;14:1328–33. Gianni C, Atoui M, Mohanty S, et al. Difference in thermodynamics between two types of esophageal temperature probes: Insights from an experimental study. Heart Rhythm 2016;13:2195–200. Tschabrunn CM, Silverstein J, Berzin T, et al. Comparison between single- and multi-sensor oesophageal temperature probes during atrial fibrillation ablation: thermodynamic characteristics. Europace 2015;17:891–7. Deneke T, Schade A, Muller P, et al. Acute safety and efficacy of a novel multipolar irrigated radiofrequency ablation catheter for pulmonary vein isolation. J Cardiovasc Electrophysiol 2014;25:339–45. Halm U, Gaspar T, Zachaus M, et al. 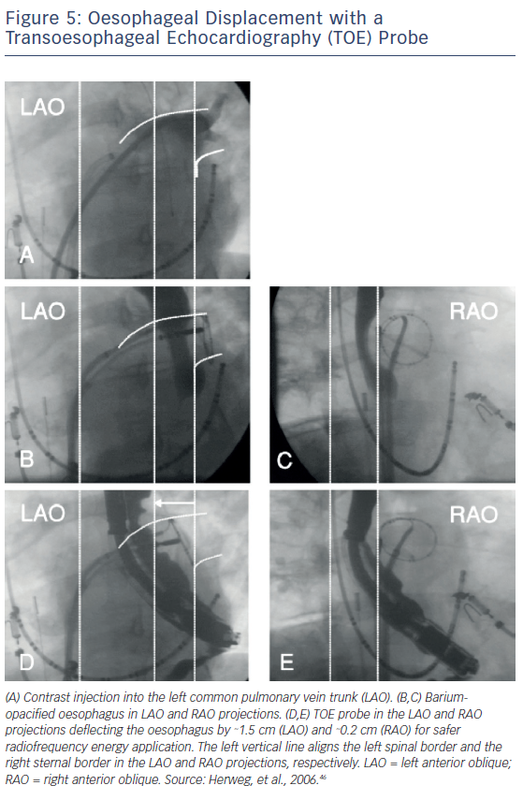 Thermal esophageal lesions after radiofrequency catheter ablation of left atrial arrhythmias. Am J Gastroenterol 2010;105:551–6. Vurma M, Dang L, Brunner-La Rocca HP, et al. Safety and efficacy of the nMARQ catheter for paroxysmal and persistent atrial fibrillation. Europace 2016;18:1164–9. Nakagawa H, Yamanashi WS, Pitha JV, et al. Comparison of in vivo tissue temperature profile and lesion geometry for radiofrequency ablation with a saline-irrigated electrode versus temperature control in a canine thigh muscle preparation. Circulation 1995;91:2264–73. Sato D, Teramoto K, Kitajima H, et al. Benefit to decrease esophageal damage using an ablation catheter with increased irrigation channels for pulmonary vein isolation. Pacing Clin Electrophysiol 2013;36:618–25. Kumar S, Romero J, Stevenson WG, et al. Impact of lowering irrigation flow rate on atrial lesion formation in thin atrial tissue. JACC: Clinical Electrophysiology 2017;3:1114–25. Chugh A, Rubenstein J, Good E, et al. Mechanical displacement of the esophagus in patients undergoing left atrial ablation of atrial fibrillation. Heart Rhythm 2009;6:319–22. Koruth JS, Reddy VY, Miller MA, et al. Mechanical esophageal displacement during catheter ablation for atrial fibrillation. J Cardiovasc Electrophysiol 2012;23:147–54. Herweg B, Johnson N, Postler G, et al. Mechanical esophageal deflection during ablation of atrial fibrillation. Pacing Clin Electrophysiol 2006;29:957–61. Parikh V, Lavu M, Jazayeri M-A, et al. Use of an esophageal retractor to prevent thermal injuries during atrial fibrillation ablation: a multi-center experience. J Am Coll Cardiol 2017;69:406. Palaniswamy C, Koruth JS, Mittnacht AJ, et al. The extent of mechanical esophageal deviation to avoid esophageal heating during catheter ablation of atrial fibrillation. JACC: Clinical Electrophysiology 2017;3:1146–54. Buch E, Vaseghi M, Cesario DA, Shivkumar K. A novel method for preventing phrenic nerve injury during catheter ablation. Heart Rhythm 2007;4:95–8. Buch E, Nakahara S, Shivkumar K. Intra-pericardial balloon retraction of the left atrium: a novel method to prevent esophageal injury during catheter ablation. Heart Rhythm 2008;5:1473–5. Nakahara S, Ramirez RJ, Buch E, et al. Intrapericardial balloon placement for prevention of collateral injury during catheter ablation of the left atrium in a porcine model. Heart Rhythm 2010;7:81–7. Yokoyama K, Nakagawa H, Seres KA, et al. Canine model of esophageal injury and atrial-esophageal fistula after applications of forward-firing high-intensity focused ultrasound and side-firing unfocused ultrasound in the left atrium and inside the pulmonary vein. Circ Arrhyth Electrophysiol 2009;2:41–9. Martinek M, Hassanein S, Bencsik G, et al. Acute development of gastroesophageal reflux after radiofrequency catheter ablation of atrial fibrillation. Heart Rhythm 2009;6:1457–62. Marrouche NF, Guenther J, Segerson NM, et al. Randomized comparison between open irrigation technology and intracardiac-echo-guided energy delivery for pulmonary vein antrum isolation: procedural parameters, outcomes, and the effect on esophageal injury. J Cardiovasc Electrophysiol 2007;18:583–8. Stevenson WG, Saltzman JR. Gastroesophageal reflux and atrial-esophageal fistula. Heart Rhythm 2009;6:1463–4. Ripley KL, Gage AA, Olsen DB, et al. Time course of esophageal lesions after catheter ablation with cryothermal and radiofrequency ablation: implication for atrio-esophageal fistula formation after catheter ablation for atrial fibrillation. J Cardiovasc Electrophysiol 2007;18:642–6. Khairy P, Chauvet P, Lehmann J, et al. Lower incidence of thrombus formation with cryoenergy versus radiofrequency catheter ablation. Circulation 2003;107:2045–50. Moreira W, Manusama R, Timmermans C, et al. Long-term follow-up after cryothermic ostial pulmonary vein isolation in paroxysmal atrial fibrillation. J Am Coll Cardiol 2008;51:850–5. Andrade JG, Khairy P, Guerra PG, et al. Efficacy and safety of cryoballoon ablation for atrial fibrillation: a systematic review of published studies. Heart Rhythm 2011;8:1444–51. Ahmed H, Neuzil P, d’Avila A, et al. The esophageal effects of cryoenergy during cryoablation for atrial fibrillation. Heart Rhythm 2009;6:962–9. John RM, Kapur S, Ellenbogen KA, Koneru JN. Atrioesophageal fistula formation with cryoballoon ablation is most commonly related to the left inferior pulmonary vein. Heart Rhythm 2017;14:184–9. Arruda MS, Armaganijan L, Di Biase L, et al. Feasibility and safety of using an esophageal protective system to eliminate esophageal thermal injury: implications on atrial-esophageal fistula following AF ablation. J Cardiovasc Electrophysiol 2009;20:1272–8. Kuwahara T, Takahashi A, Okubo K, et al. Oesophageal cooling with ice water does not reduce the incidence of oesophageal lesions complicating catheter ablation of atrial fibrillation: randomized controlled study. Europace 2014;16:834–9. Kapur S, Barbhaiya C, Deneke T, Michaud GF. Esophageal injury and atrioesophageal fistula caused by ablation for atrial fibrillation. Circulation 2017;136:1247–55. Keshishian J, Young J, Hill E, Saloum Y, Brady PG. Esophageal injury following radiofrequency ablation for atrial fibrillation: injury classification. Gastroenterol Hepatol (NY). 2012;8:411–4.